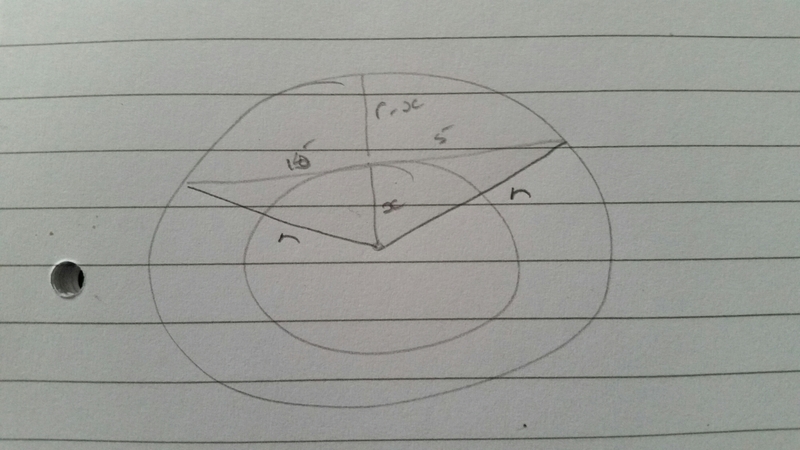 I assigned the arbitrary variables r and x to the radii of the larger and smaller circles respectively and used the fact that tangents are perpendicular to right angles, and the symmetry of isosceles triangles, to construct two right angled triangles. I wrote an expression for the required area in r and x. 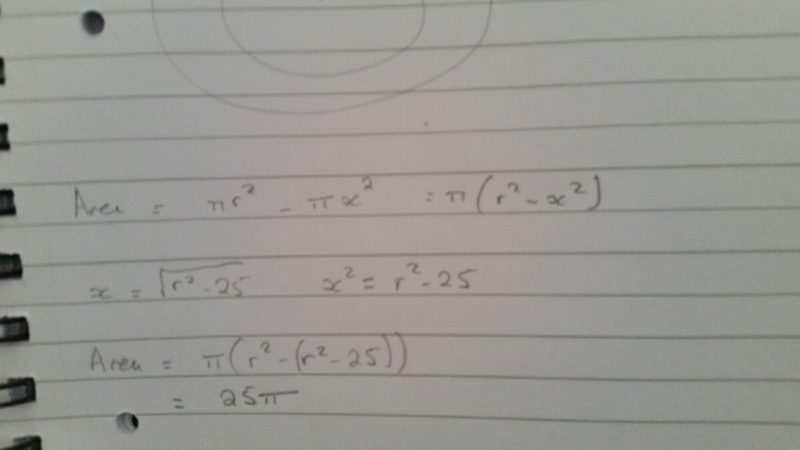 Used Pythagoras’s Theorem to find an expression for x in terms or r, subbed it in and got the lovely answer of 25pi. An interesting little puzzle, did you solve it the same way? I’d love to hear alternative solutions. What are the challenges facing maths teachers? 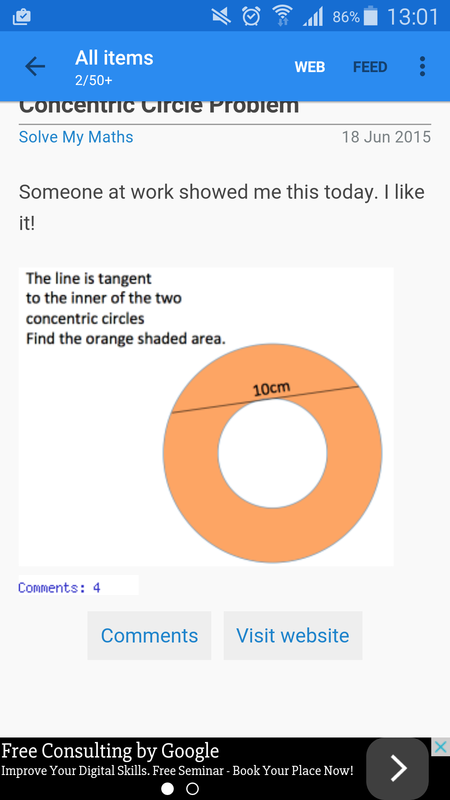 This post was originally published here on Edustaff on 26th June 2015. A while ago I received an email asking what I thought were the main challenges facing maths teachers, and it got me thinking. The challenges fall into two main categories. There’s the problems all teachers face and then there’s the problems that are more specific to maths teachers. For the wider profession, the main issues revolve around the negative views of teaching and teachers that seem to be all too prevalent in today’s world. I’m not sure where they stem from, but I don’t think they’re helped by the scorn the media throws onto us, especially during the strike action the other year. These challenges seem exacerbated by the government rhetoric that has seen education secretaries refer to teachers as “enemies of hope”, “dealers in despair” and “enemies of promise”. Breaking these negative stereotypes is also not helped by the military analogies used. Recently the Prime Minister announced he was to “wage war” on coasting schools. I agree that no school should be coasting, but using terms like ‘wage war’ gives the positive change we are aspiring to a very negative spin. I don’t know how we, as teachers, can alter this. We already work our socks off to ensure that the learners in our care get the best possible education… I guess we just keep up the hard work and hope the negativity drops. I believe the main maths-specific issues also centre on perceptions. However, the challenges here are down to the perceptions of maths espoused by many people, rather than the perceptions of the teachers themselves. I’ve heard a Head of English say she never understood algebra and it didn’t do her any harm; I’ve heard teaching assistants say “I’ve never understood maths”; I’ve heard a Deputy Head question year 11s as to why they’d consider choosing a “boring” A-level. “It was well easy,” she said, “it’s only algebra I can’t do.” It took all I had to explain it was algebra without laughing. I think this example suggests that the parents in question were failed by their own maths teachers. I think the best way to combat this is to really make sure this generation love maths and do understand it, avoiding a similar situation in the future. As for the teachers, we all need to support each other. If teachers of other subjects are struggling with basic maths, we can help with that, and if they can start to realise the damage they do when rubbishing our subject, surely they would stop! I’d never think of slagging off another subject to learners, and I wish everyone felt the same. For too long we’ve seen the dismantling of local authorities and the removal of schooling from state control. Some of the “freedoms” offered are worrying, no need for the national curriculum etc. I am also worried by big academy chains and their motives. I know from experience many small chains are run well, but as the bigger chains expand I worry about what will happen. I worry about a race to the bottom, how cheaply can we run this school, and ultimately a switch into a for profit nature of schooling. I’d go further and suggest all schools, including private schools, be brought into local authorities to ensure minimum standards are met and raised and all children received a top quality education. For too long we have tried, and failed, to create an educational system that caters for all. Vocational education is something we have repeatedly got wrong. I’d love to see the leadership candidates discussing how we can get it right, make it a real alternative with the same rigour and esteem as it’s academic counterpart. I was intrigued by Tristram Hunt’s comments on this pre election and would have liked to see how they panned out. I do worry about the lack of knowledge some school leavers show about politics and democracy. It’s something that has been looked at before, but has not improved in recent years. I’d like to see compulsory political education for all, giving a broad overview of the way our democracy runs and the history behind how and why it developed as it did. I’d like to see the teacher shortage acknowledged and addressed. Consecutive government’s have thrown money at teacher recruitment but have not really addressed the issues. The first think I’d like to see is an end to “teacher bashing” from the political elite. Some of the criticisms Gove levied at the profession and the insults will have weakened public perception of teachers which is already lower than it should be. I’d like to hear candidates put forward ideas to improve the status as I think that’s the way we can recruit passionate people into the profession and hold onto the ones we’ve got. This post was originally published on Labour Teachers here, on 12th June 2015. I recently wrote about my views on Academies and Free Schools (you can find the post here). I know many people hold strong views for or against them but given the current government are majorly for them I feel trying to protest against them currently is a little bit pointless. The speed of the Academies project has been immense and it us rapidly growing and continuing. I worry about this bill and the ideas behind it. The assumption is that all academies are improvements on local authority schools. Now this is true for some schools but not all schools and I feel the assumption itself is dangerous. I’ve also seen some pretty strange judgments handed down to Schools in recent years where the rumours have abounded that pressure was being applied to force academisation. It’s clear to me, reading this bill, that the Conservative government are desperate for all schools to become academies. I’m not sure their reasons for this, I assume it’s due to their ideological belief that the state should be minimised and everything handed over to a competitive free market. Although the cynical side of me wonders if they are trying to move education out of local authority control because Labour still control a vast amount of local authorities. Either way the electorate handed them a majority last month and they are now in a position to drive through these reforms. I still hold reservations about academies and free schools, but one thing really bothers me about the current climate. Pretty soon academies will be in the vast majority, meaning very little money will be put into the local authorities and those schools doing well under local authority control will be put in a position which holds them back. They will be receiving less finding and less support. I wish the government would be more honest about their reasons. It’s an ideological move, not one done to improve failing schools, and I wish they’d just come out and say it. Rather than bring in piecemeal bits of policy to take bits at a time, (1st all outstanding schools can be academies, then “all failing schools” now it seems to be all RI/”coasting schools etc) why not just tell us the real plan? All schools will be forced to become academies. Just get on with it, tell us the truth, tell us the plan and give us the time scale. At least then everyone would know where they stand.